Labels on most probiotic brands boast a high amount of bacteria (CFU), but very few make it past your stomach acids to your colon, where probiotics are needed most. Hallelujah Diet® Probiotic delivers up to 60% of its bacteria all the way to your colon – giving you far more effective results! 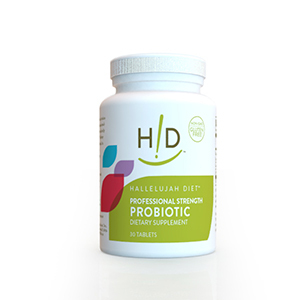 The secret to the incredible effectiveness of Hallelujah Diet® Professional Strength Probiotic is a patented probiotic delivery system. Moisture and oxygen can damage probiotics in capsules. Hallelujah Diet® Probiotics are manufactured as a solid caplet with LiveBac® live bacteria technology. LiveBac protects the caplets from moisture and oxygen — and that means you don’t need to keep them in the refrigerator. In fact, Hallelujah Diet® Probiotic supplement is stable at room temperature for at least 18 months. Our probiotics are tested in real time to ensure that the CFU claimed on the label is what you get in each caplet, if not more!